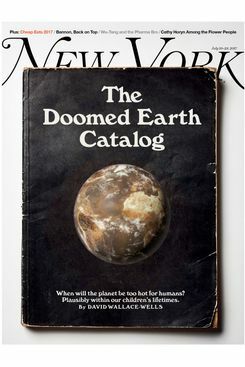 The cover of New York’s current issue takes inspiration (as anyone of a certain age will recognize) from the Whole Earth Catalog, the counterculture manual first published by Stewart Brand in 1968. It was a how-to book for people with an urge to go back to the land, giving basic instructions to citified folks about operating wood stoves and drilling wells and such. 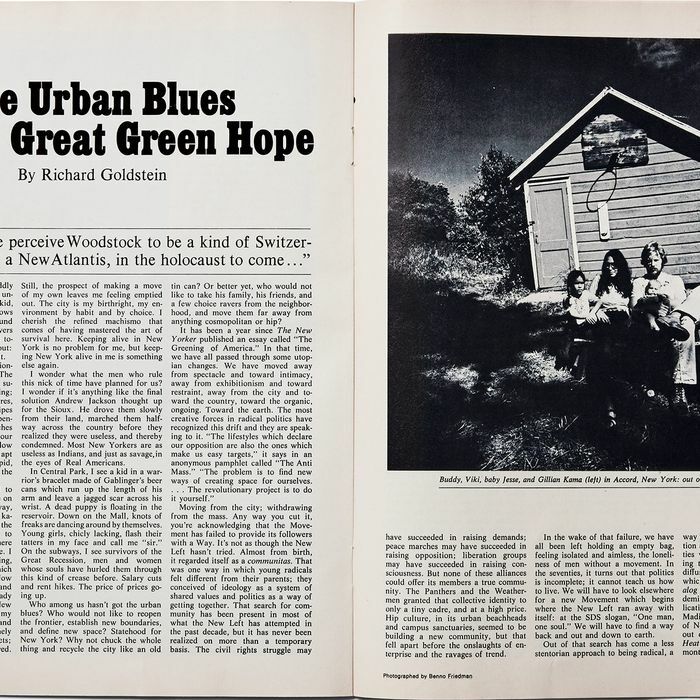 “The Urban Blues and the Great Green Hope” appeared in the issue of August 23, 1971. “Moving from the city; withdrawing from the mass. Any way you cut it, you’re acknowledging that the Movement has failed to provide its followers with a Way,” Goldstein wrote. “Hip culture, in its urban beachheads and campus sanctuaries, seemed to be building a new community, but that fell apart before the onslaughts of enterprise and the ravages of trend. In the wake of that failure, we have all been left holding an empty bag, feeling isolated and aimless, the loneliness of men without a movement. 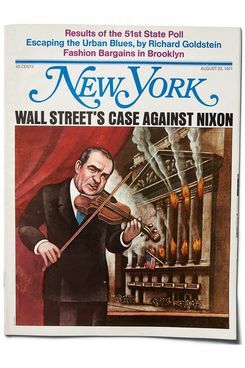 In the seventies, it turns out that politics is incomplete; it cannot teach us how to live.” We meet Mike and Harriet Kramer, out of Cobble Hill and into a house in Woodstock with their two small daughters; we meet Phil and Toby, moving to Vermont and eating grits for breakfast. *This article appears in the July 10, 2017, issue of New York Magazine.